Those familiar with Harry's LapTimer know we are in constant search for new and innovative options for your perfect track experience! For those who prefer to keep their smartphone in a safe place instead of mounting it into the racing car or motorbike, PUSH INC. announced their new PUSH SmartGauge today. This small and easy to install data logger comes with an exciting set of features. The one we like most is its seamless integration with Harry's LapTimer: while LapTimer comes with logger import options for some time, handling data files can be cumbersome. That's where PUSH in coming in. While moving, it records data automatically. 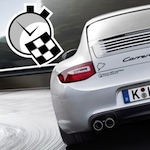 Select the session recorded in PUSH's app and touch LapTimer is all you need to do now. LapTimer will transfer the data, load track sets required, and place the result in its Lap List. On site, in your car, on in the pits. Easy. We recommend PUSH SmartGauge for motorbikes use in particular. Harry's LapTimer v20 supports PUSH SmartGauge already! During the next 2 days, you can order PUSH SmartGauge with a US$ 50 discount on PUSH INC's web site: use http://www.pushthelimit.net/?aff=12 and enter the code 4GJSDJUX3S9M during check out. If Autosport Labs ever gets their act together and implements iOS file sharing, do you envision something similar for the RaceCapture device? Since there's no onboard memory that I know of in the RaceCapture, you'd still have to have your phone with you, but it wouldn't have to be mounted unless you wanted to use the dashboard. At the moment, they have problems with duplicate log entries in their iOS beta app. At least the RCP/MK2 has a Sd card slot for logging. A similar approach would be possible here. Same for the XGPS by the way, they have 10 Hz logging available too. For both, I do not have import capabilities so far, they use their RCP log and KML respectively. Just received my PUSH gauge last month! Love the integration! The URL scheme (deep link) to download PUSH data for the Android version has changed in v21. Please contact PUSH, they will be able to provide instructions. In case you are using this new URL scheme already but see issues nevertheless, please contact me by mail (Harry@gps-laptimer.de) and send the link you are using to import data. I was never able to get anywhere with this so I unfortunately had to resurrect an old iphone and bought the cheapest version app(since i have the most expensive one for android installed)... and that is at least a work around. sakkakth wrote: I was never able to get anywhere with this so I unfortunately had to resurrect an old iphone and bought the cheapest version app(since i have the most expensive one for android installed)... and that is at least a work around. Have you contacted PUSH for support and did they provide you with an URL? Push seems to be in some transitional phase. The smartgauge requires the data to be uploaded to a server before you can access it. It seems Push is no longer supporting the server, so you cannot access your data. I've tried numerous times to contact Push with no success. The smartgauge is still for sale on their website but the gauge itself is completely useless at this point. I'm very disappointed, basically I have a $400 paper weight now. Please advise people not to deal with this disreputable company. Yup, getting pretty frustrating no being able to get the data off the PUSH.